ESCANABA — The Escanaba Cubs had just two wins all season going into the American Legion baseball Zone 5 tournament being held at their own Al Ness Field and in Gladstone. That didn’t matter Thursday, however, as the Cubs rallied for a 6-5 victory over the Negaunee Diamonds in the Escanaba Division of pool play. Esky (3-18) trailed 4-1 after five innings of a contest that endured a 40-minute rain and lightning delay. The Cubs then cashed in on five errors in the sixth, tying the score 4-4. Negaunee regained the lead in its half of the sixth on Carter Richardson’s single to left field. Drew Rodman retied the game on Tyler Lawson’s infield single in the seventh. Lawson then scored the game-winner on a throwing error moments later. 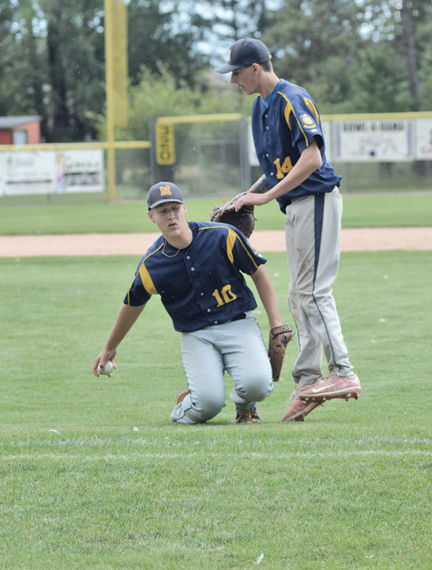 Negaunee (12-10) committed nine miscues while the Cubs had two. Grant LaMarche, who got the complete-game victory, retired the Diamonds in order in the bottom of the seventh. “It’s heart-breaking,” Negaunee manager Jason Siik said. “The guys played real good baseball the past couple weeks. We started good and felt confident when it was 4-1. Five errors in the sixth, it’s hard to overcome that. Yet, we still felt confident going into the bottom of the seventh. Negaunee began the scoring on Keenan Johnson’s single to right-center in the first. Esky’s Connor Aiken knotted the contest off an error in the third. The Diamonds then regained the lead on Taylor Laurin’s sacrifice fly to center in their half of the third. Negaunee’s Jacob Adriano raised the count to 3-1 on a fielding error in the fourth and Johnson’s sacrifice fly to right made it 4-1 in the fifth. LaMarche struck out three, walked none and allowed six hits. Johnson took the loss in relief of Tanner Peterson, who fanned two, walked three and gave up five runs on three hits before reaching the pitch count limit (105) in the seventh. Esky finished with four hits, including a pair of infield singles by Lawson. Esky hosts Marquette at 2 p.m. today and the Sault Ste. Marie-based Eastern U.P. Travelers at 8 p.m.
Also in the Escanaba Division today, Negaunee faces EUP at 11 a.m., then the Diamonds take on their rival Marquette Blues at 5 p.m. In the Gladstone Division today, Menominee plays Copper Country at 11 a.m., Gladstone takes on Bark River at 2 p.m., Bark River faces Menominee at 5 p.m. and Gladstone plays CC at 8 p.m. The top two teams from each four-team division advance to the semifinals to be played in Gladstone and Escanaba at noon Saturday, with the championship set right after that at 3 p.m. in Escanaba. With Menominee earning an automatic berth into the Class A state tourney it’s hosting in a week, two other teams from Zone 5 will also advance. Because of that, if Menominee reaches the zone championship game, a third-place game will be played in Gladstone at 3 p.m. Saturday to determine the second earned spot for the state tournament.